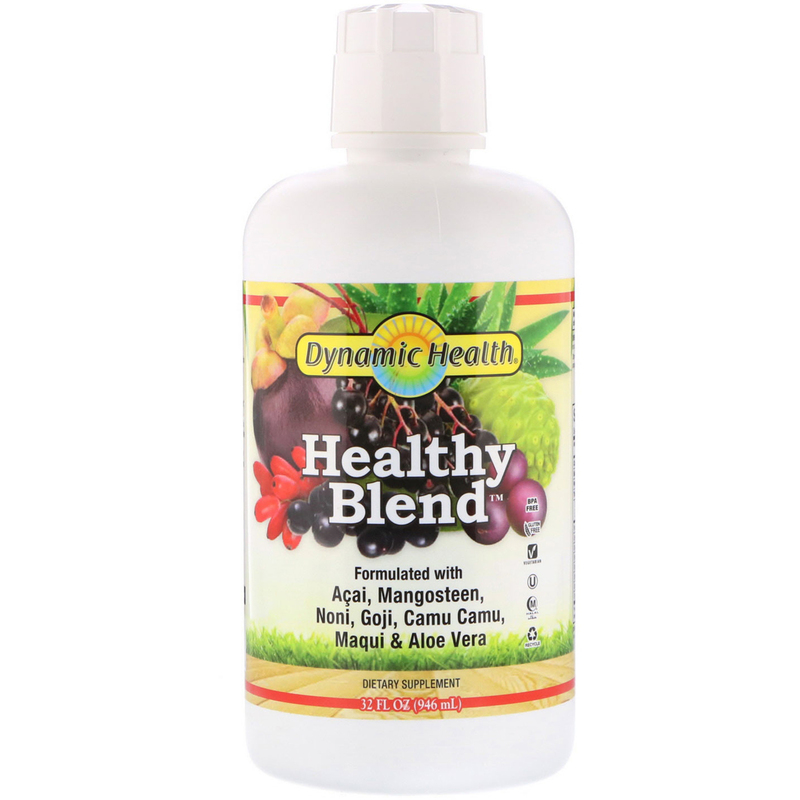 Dynamic Health Healthy Blend is a delicious proprietary juice supplement that combines the goodness of juices sourced from different regions of the world to help promote healthy living. This unique combination of juices contains naturally occurring vitamins, minerals, enzymes, amino acids and a unique profile of antioxidants. Acai flourishes in the rainforests and contains powerful antioxidants, omega oils and phytosterols. Mangosteen, known as the "Queen of Fruits", contains unique antioxidants called xanthones. Noni has been treasured for hundreds of years by inhabitants of Tahiti and other exotic South Pacific islands and contains Proxeronine which helps the body regulate and provide structure to proteins. Goji berries have been treasured by the Himalayan people for their health properties and the energy that they provide. Camu Camu, native to the Amazon rainforests, is rich in Vitamin C. Maqui berries are grown wild in the Patagonia region of South America and contain antioxidants known as anthocyanins. Rounding out this unique formula, we have added Aloe Vera Juice which has been prized for centuries for its unique health properties. Use only as directed. Take 2 tbsp (30 ml) up to four times daily or as directed by your health care practitioner. 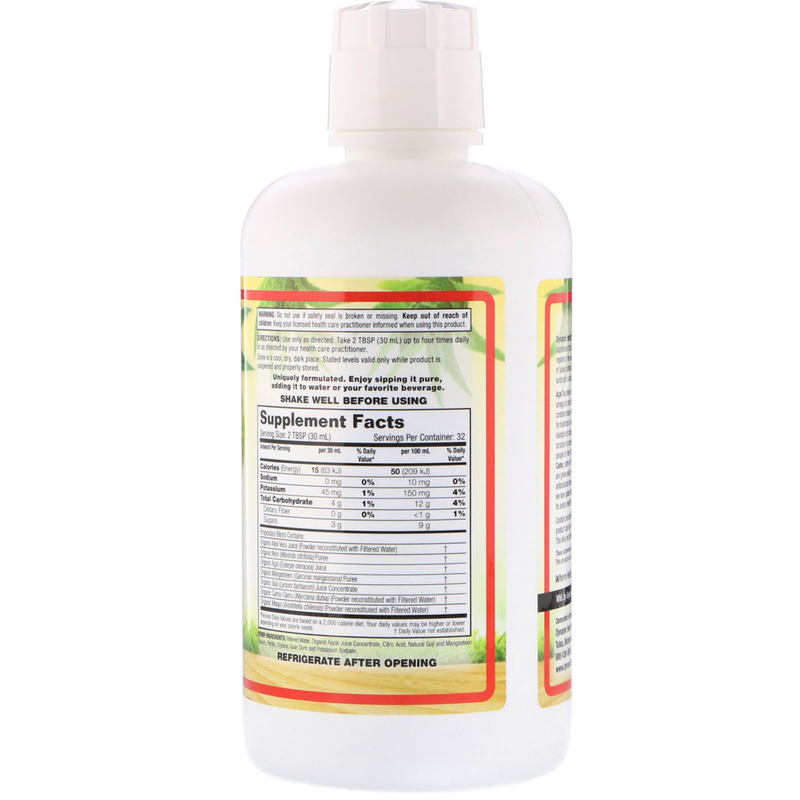 Filtered water, organic apple juice concentrate, citric acid, natural goji and mangosteen flavors, pectin, organic guar gum and potassium sorbate. Contains no artificial colors or artificial flavors. Natural ingredients in this product can vary the color, taste and consistency from batch to batch. This does not affect potency or quality. *Percent Daily Values are based on a 2,000 calorie diet. Your Daily a Values may be higher or lower depending on your calorie needs.